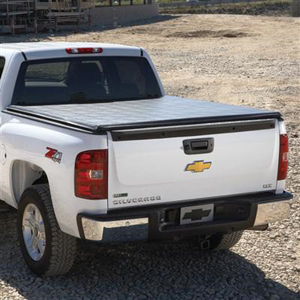 This Hard Folding Tonneau Cover`s innovative easy-to-use clamps require no tools for installation. The flat and smooth tri-fold design allows easy opening and closing. 5 foot 8 inch Short Box, Base High Gloss Vinyl Cover, Black, This textured high gloss black vinyl cover is rustproof, non-corrosive, and water resistant. Requires Bed Rail Protectors (part # 17802470). 6 foot 6 inch Standard Box, Base High Gloss Vinyl Cover, Black, Requires Bed Rail Protectors (part # 17802471 or 17802474). 8 foot Long Box, Premium Ragtop Cover, Black, This textured high gloss black vinyl cover is rustproof, non-corrosive, and water resistant. Requires Bed Rail Protectors (part # 17802472 or 17802475). 5 foot 8 inch Short Box, Premium Ragtop Cover, Black, This durable, premium cloth ragtop black cover is rustproof, non-corrosive, and water resistant. Requires Bed Rail Protectors (part # 17802470). 8 foot Long Box, Base High Gloss Vinyl Cover, Black, This textured high gloss black vinyl cover is rustproof, non-corrosive, and water resistant. Requires Bed Rail Protectors (part # 17802472 or 17802475). 6 foot 6 inch Standard Box, Premium Ragtop Cover, Black, This durable, premium cloth ragtop black cover is rustproof, non-corrosive, and water resistant. Requires Bed Rail Protectors (part # 17802471 or 17802474).